Wearing black, holding black flags and releasing black helium balloons into the sky, the protesters brought traffic to a halt to express outrage over the Centre’s failure in implementing the Supreme Court order on Cauvery water. Prime Minister Narendra Modi’s visit to Chennai on Thursday was marked by thousands of Cauvery protesters marching through the streets, loudly chanting ‘Go back Modi’. Wearing black, holding black flags and releasing black helium balloons into the sky, the protesters brought traffic to a halt to express outrage over the Centre’s failure in implementing the Supreme Court order on Cauvery water. The PM, who was on a day-long fast to protest against the washout of the budget session, had to take a helicopter from Chennai airport to two venues in the city to attend scheduled programmes. Modi landed around 9.20 am even as a traffic snarl clogged a 10-km stretch on the busy GST road connecting the airport with the city. Defence Minister Nirmala Sitharaman, who was in the city from Wednesday, was seen walking a long stretch near the airport to enter a special gate to receive the PM as her convoy was struck in traffic. After being received by Sitharaman, Governor Banwarilal Purohit and CM Edappadi K Palaniswami, Modi’s chopper took off for the East Coast Road near Kovalam where he inaugurated Defexpo 2018. Sources in Air Traffic Control said his chopper had to change direction because of hundreds of black balloons in the sky. Modi was seen exchanging few words with Palaniswami and senior ministers during his trip. After the inaugural event and briefly witnessing Defexpo demonstrations, his chopper left for IIT Madras. Preparations for the helipad near the IIT campus started a few days ago, and demolition of a wall next to the Guindy Reserve Forest to facilitate his passage kicked up a controversy, with politicians like MDMK’s Vaiko, once an ally of Modi, questioning the PM’s decision to use a chopper for city travel and calling him a coward. Vaiko said that when India celebrates Independence Day in 2047, India will be split into pieces. 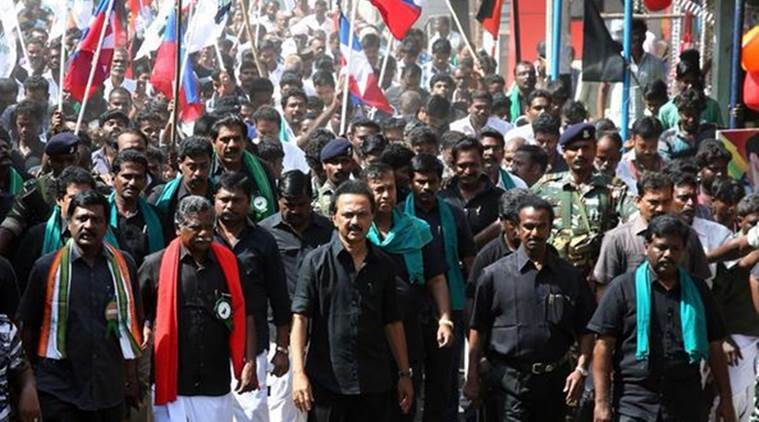 “Many states will become separate countries, and Tamil Nadu will be among them,” he said. Students were also seen protesting by the road inside the IIT-M campus, demanding that Higher Education Funding Agency be scrapped. The PM’s itinerary included a meeting with officials and editors of leading media firms in the city. While almost all of them turned up for the meeting, sources said the PM spent hardly five minutes with them. While the protests led to the arrest of 4,000 people till evening, hundreds of government buses were deployed to remove protesters. Many transport workers operating the buses were also seen wearing black. Social media, too, reacted strongly with trending hashtags like #GoBackModi and #OdiPoModi (Runaway Modi). A 25-year-old committed suicide in Erode on Wednesday night in protest against the Centre’s stand on Cauvery. A senior police officer said B Dharmalingam, a small-time vendor, committed suicide after writing that he strongly opposed Modi’s visit to Tamil Nadu. Before the PM’s flight to Delhi took off from the airport around 2.30 pm, Palaniswami submitted a memorandum to him demanding constitution of the Cauvery Water Management Board as per the SC order. Modi did not utter a word about the Cauvery issue in his speeches Thursday.